Makeup application is an art, and just like a sculptor or painter, you need certain tools to properly work your craft. This section covers the various items you will need in order to apply your makeup effectively and efficiently to get the look you want without spending hours in front of the mirror when you only need to spend minutes. The tools discussed in this section include makeup brushes and other makeup application aids, as well as the essential items you need to carry in your purse for on the go touch ups. And because it�s a pet peeve of mine, I will also cover off on proper hygiene procedures. I just can�t emphasize enough how important it is to use the right tools for the job if you want maximum results with minimum effort. Using the right brush for the look you�re trying to achieve makes it so much easier to do and so much more time efficient. So if you�re like most people who want to look their best each day but don�t have a lot of time to devote to their morning makeup application, DON�T SKIMP ON YOUR BRUSHES! Think about it from a common sense perspective. You spend a small fortune on your makeup, or so it seems, so why put it on your face with just anything? There�s a huge difference between the cheap, mass produced brushes which transfer as much brush hair as blush to your cheeks (ever been there?) and the good quality, hand made brushes which deposit just the right amount of product and blend it beautifully. Brushes made from natural hairs trap and hold powders the best yet release it easily when the brush is pressed against your skin, so they deliver and apply makeup the most effectively. Try to purchase ones made of �first cut� natural hair so that the hair tips are preserved. (The tips of first cut hair are soft and pointed, but the ends of second cut hairs are flat across. It�s like the difference between the soft hair on your forearms versus the coarser hair that grows on your legs if you shave them.) Note that brushes constructed from first cut natural hair must be hand made in order to preserve the hair tips. Natural hair brushes get softer with each use and for powder applications, the softer the better. Synthetic hair brushes are not absorbent, do not trap powder and get stiffer over time, so they are more suitable for concealer, eyeliner or liquid foundation. The best natural hair brushes are made of Kolinsky sable mink. They are the finest and softest, but of course are also the most expensive. Squirrel hair brushes are popular with makeup artists. However, they must be made from long squirrel hair as only it ends in a very fine point. Badger hair is also used to make brushes, but quality varies depending on the type of hair used. The higher quality badger brushes will have the most elasticity and will be springy and soft against your face. Look for badger brushes that have a variegated appearance � light-dark-light. Grey hair badger brushes are less elastic and therefore of significantly inferior quality. Pony hair brushes are a less expensive alternative yet are still of reasonably good quality. They are soft, but will have less of the fine, pointy tips than say the squirrel or kolinsky sable brushes. Goat hair is very commonly used for mid-range price point brushes, but quality can vary widely. First cut goat hair is sometimes referred to as �squirrel substitute�, but most mass produced brushes are made of blunt cut goat hair, so are generally rather poor quality. Probably the most confusing of all brushes are those used for eye makeup application. The general rule of thumb is the size of the brush should relate to the size of the area of the eye you�re working with. While by no means an exhaustive listing of all the various eye brushes available, the following image shows some of the more popular ones. I�ve provided a description of what each is best used for underneath. Eye Definer: Great for applying a wash of shadow across the entire eye area, and for the overall blending of your shadow colours. You can also use this brush to apply mid-tone colours into the crease, but it won�t be as precise as the Eye Crease brush. Shading: This brush is not as wide or as thick as the Eye Defining brush, so it can be used to place and blend colour in a more specifically defined area, such as across the eyelid. Eye Crease: This brush is thick like the Eye Definer brush but smaller and more pointed at the centre, which gives you greater precision when placing and blending colours in the crease of your eye. Larger Angle: Angled brushes are great for lining shadow along the lash line and into the outer corners of the crease. The Larger Angle brush is much thicker than the Smaller Angle as so the application won�t be as precise � use it when you want a smudge of colour as opposed to a thin line. Smaller Angle: The Smaller Angle is shorter and thinner than the Larger Angle, which makes it stiffer. This brush is often used to apply creme or powder colour to the eyebrows, but it is also great for more precision lining along the lash line. I personally use the Smaller Angle for when I apply eye shadow as eyeliner. It works great whether the shadow is applied wet or dry. This Smaller Angle brush can also be used to push color right to the roots of the lashes to make the lashes look thicker. Sponge Tip: The Sponge Tip on this brush picks up more colour than the regular brushes and so it will also apply the shadow more heavily. Use it when you want to apply a lot of colour to a specific spot. Eyeliner: This thin brush is used for applying liquid, creme, gel or cake eyeliner with precision. Brows & Lashes: This combination comb and brush is used primarily to groom the eyebrows, but I also like to use the comb to separate my lashes after applying mascara. I�ve found that some brands can be a little clumpier as they get older (probably due to the product starting to dry out), but combing the lashes separates them beautifully by pulling off any excess mascara, including the clumps. However, if you decide to use the comb for this purpose make sure you do so while the mascara is still wet, or you risk pulling out your eyelashes if the dried clumps don�t separate from them as you pull the comb through. Now that the eye brushes are out of the way, the remaining ones are quite simple and straight forward. Powder: A big, fluffy brush is great for applying loose powder (mineral or regular), because it gives a smooth, sheer and even application. 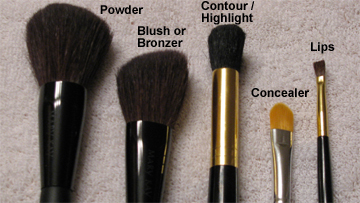 Smaller powder brushes are also available if you wish to apply only to specific areas of your face (i.e. cheeks only so that your blush will glide on more smoothly). Blush or Bronzer: Although different shapes and sizes are available, a soft, full brush will provide a more natural application (thinner brushes will tend to apply more concentrated colour in a smaller area, think streaky). The slight angle of the brush will allow you to better blend as you apply. Contour/Highlight: The smaller size of the Contour/Highlight brush allows for more precise application, since you are applying these products to specific areas of your face only. Concealer: This synthetic brush is quite stiff compared to regular brushes and so it is great for applying and blending concealer product, particularly under the eyes. A larger version of this brush is also available for applying and blending foundation. Lips: Using a lip brush better allows you to control how much lipstick or lip gloss goes onto your lips. Because you can be more accurate in your application around the edges, the end result tends to look smoother and more polished. And a lip brush is also great for getting that last little bit of your favourite shade out of the bottom of the tube. Non latex sponges � if you like to use them for applying liquid products such as foundation and concealer. Powder puff � optional, for pressed or loose powder if you prefer to use puffs over brushes. Purchase a good quality one (fluffy with a soft velour texture) so you can wash it to keep it clean. Cotton cosmetic pads � great for use with toners and eye makeup remover products. Eye makeup remover � please, don�t use your facial cleanser (or horrors, plain soap and water) to remove your eye makeup. Facial cleansers are not formulated to do that and so in order to remove your eye mascara fully you�ll end up scrubbing excessively at the delicate eye area. And if you don�t remove your mascara properly, your eyelashes could develop mould at the root and fall off! So use an eye makeup remover product (either pre-soaked eye makeup remover pads or liquid remover on a cotton cosmetic pad) by pressing it against your eye and waiting a few moments for the remover to fully loosen your mascara before wiping gently to remove. Head band � great for keeping your hair off your face so you can properly blend your makeup into your hairline. Tweezers � for tidying up your brows. Sharpener � if you use pencil eyeliners that do not self sharpen. If you don�t think carefully about what you actually need throughout the day and are disciplined about what goes into your purse, you could end up carrying around a lot of extra �stuff� that adds unnecessary weight to your purse and makes it more difficult to find what you�re looking for. Personally I hate clutter and I don�t like wasting time searching for my lipstick amongst a jumble of various products, so I�ve put together a bare bones listing of what you actually need to get you through the day. You can consider this list your starting point and then add or subtract as required for your personal situation. Mirror � as part of a powder compact or on its own if you don�t carry powder in your purse. Pressed powder compact � for touchups during the day, particularly if you have oily skin. Alternatively or in addition, women with oily skin could also carry oil absorbing blotting papers. Lipstick or lip gloss � whichever your preference. As I�ve previously stated, lipstick does more to enhance your professional polish than anything else so you should always ensure it�s properly applied. A basic neutral shade well matched to your skin tone can be worn no matter what other makeup or clothes you�re wearing. If you keep the colour light, you won�t need to be as precise in your application and as long as feathering is not a problem you may not need to worry about lip liner. Lip liner � if necessary. See above point. Mascara � Nothing brightens your eyes faster than a fresh coat of mascara. Q-tips � as the day goes on your mascara could end up under your eyes and so a Q-tip is handy to gently smooth it off. Dental floss � there's nothing more distracting (and annoying) than something stuck in your teeth. Hand creme � travel size of course. If your makeup has been well applied in the morning, you shouldn�t require anything else in your on-the-go makeup kit. If you�re going out after work one evening, you can always slip in some eye shadow and blush, but I wouldn�t make a habit of it. Assuming your shadow and blush is powder format, more often than not the banging and bumping these colour products receive inside your purse will cause the powder to crack and make a mess. This also causes unnecessary wastage of product. If you are in the habit of going out right after work on a regular basis, you could always keep eye shadow, blush and any other additional products you might need at your desk. Keep your makeup bag clean and dry to avoid bacteria build up. Wash your hands before touching either your face or your makeup product. Do not blow on your brushes to remove excess product; tap the brush on the side of the sink instead. Wash your sponges at least weekly and replace monthly. Sharpen pencils regularly to remove any bacteria which could be sitting on the surface of the pencil. Your makeup, unfortunately, does not have unlimited shelf life. As a general rule of thumb, once opened, you should keep your makeup no longer than one year. The exceptions are mascara (3 months), liquid eyeliner (6 months), eyeliner pencils (2 years if sharpened regularly) and lipstick (2 years). Not only will using clean brushes result in better product application, it will also prevent bacteria build up which could cause breakouts, rashes or infections. For best results clean your brushes after each use by lightly rubbing them against tissue to remove makeup product and then fully clean and disinfect them weekly. If your brushes are made from natural hairs, you can wash them weekly with regular hair shampoo. Dab a bit of shampoo onto the brush and massage it in lightly. Then rinse well, making sure there are no traces of product remaining. Disinfect your brushes by rinsing them with a minimum 70% alcohol solution. I purchased a small spray bottle from Zellers (in the travel size cosmetics area) and a 99% isopropanol alcohol solution (from their pharmacy department) at a very reasonable price. Once my brushes have been washed, I spray a little of the solution onto the brush hairs and gently rub it throughout. After the brushes have been cleaned and disinfected, I rinse them well, squeeze out excess moisture and then lay them on a clean towel to dry overnight.